Science fiction lovers will be teleported to another time and place in this unique anthology of fanciful stories from a variety of famous award-winning writers. Even more enticing is to ponder and discover the author for each of these tales that challenge the intellect and imagination. Since the names are encoded it’s up to the reader to match the story to the author. Find out what happens in the world’s newest profession and what befalls a gifted musician during his last concert and why a perfectly matched and loving couple cannot marry. What are Arboreal hominids and who are the Monsters of Dis? Does the invasion of machines into the sanctuary of a cathedral denote the end of the world? “The Mystery of the Young Gentleman,” “A Touch of Truth,” “The Man Who Floated in Time,” “Event at Holiday Rock,” “How It Works,” and “Do I Dare to Eat a Peach?” are just a sampling of what’s in store for the reader. These and other stories by a selection of outstanding names—Barry Malzberg, Bill Pronzini, Robert Silverberg, Jack Williamson, Joanna Russ—are all one needs to get caught up in htis futuristic journey. Isaac Asimov provides the introduction to each selection, notes that hint and tease but never reveal. 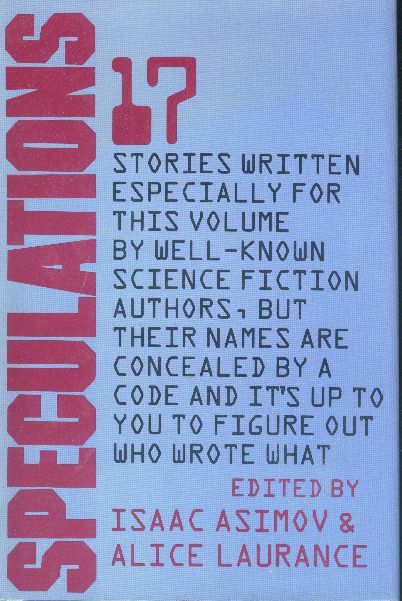 I actually enjoyed this anthology of original stories (with the authors’ names encoded, as had been done with Who Done It?) rather more than I thought. In fact, Asimov’s own contribution to the volume, “The Winds of Change” is one of the weakest stories in the volume. It’s fairly nice, if never truly spectacular, and worth reading, although there is very little of genuine interest here for the Asimov fan.